According to legend, Berbatov’s Mancunian adventure started unconventionally – under a blanket in the back of Ferguson’s car, as he was speedily whisked away from the admiring hands of Manchester City. In years hence though, all has been predictable. The daily abuse, the cheap cracks and descriptors star ting with “l” are functions of a society inherently against footballers in the mold of Dimitar Berbatov. Despite standing at six foot two, the Bulgarian hardly intimidates. His stature is slightly offset by a permanent slump of the shoulders and furrowing of the brow, two characteristics most manifest in times of struggle. 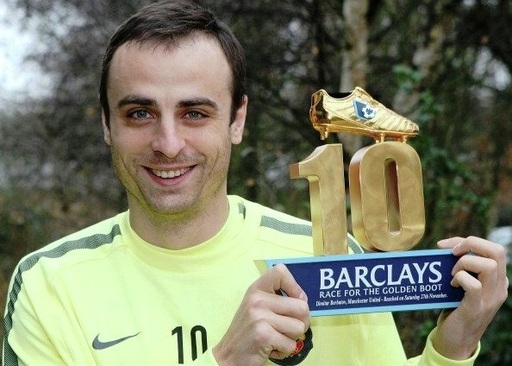 And for Berbatov, struggle is never far away. Quite apart from the expectation automatically applied to all Manchester United front players – especially ones that cost in excess of thirty million pounds – Berbatov is the subject of a special kind of scrutiny. There is an unshakable feeling among commentators and journalists alike that his case deserves questioning of an intensity normally only applied to England managers, brothel frequenters and John Terry. To see Berbatov play is for many to have triggered a sort of righteous indignation, anger at an individual so distinctly different from the Premier League’s proletariat masses. The haughty exterior, hair band (until it was shorn a couple seasons ago) and deceptive, almost arrogant movement, all made great copy throughout each season of supposed under performance. This one is by me, The Chairman; David Yaffe-Bellany, editor of In For The Hat Trick. The rain glistened off his head. Sparkling like the cosmos, the gloriously bald Nicolas Anelka took his first tentative steps. In the slightly blurred background, Van Der Sar beat his hands together looking, presumably, to inspire a last bout of energy. Twenty fellows anxiously waited, millions more consumed excitedly, all were transfixed by the action unfolding. I had always been a sucker for penalty shoot-outs. The sheer, almost manufactured drama inherent in these most ultimate of deciders is an addictive drug – pure, unadulterated adrenaline. But here something was different. The grown men covering their eyes with scarves were my men, the sweat soaked victims of football’s fickle executioner were my players. Everything was distinctly more personal. A neglected, fast cooling box of pizza lay discarded in the corner, beside it, an untouched pitcher of water. ESPN’s transmission lit up a rather morbid setting, even Tommy Smyth’s inept analysis was met with no complaint. Laying prone on the couch was a rather unattractive lifeform, its steely gaze fixed on the television – as the nostalgic elderly might have it, a quintessential twenty-first century human. As Anelka strode nervously to the penalty spot, the slumping figure straightened to attention. Expectation began to prevail, hope usurped negativity. Dressed in marvelous green, Van Der Sar looked the part. His arms waved menacingly, daring Anelka to score, daring him to deny United a third sojourn into European nirvana. Rangers fan and editor of Two Banks of Four, Alistair Hunter kicks off our series with his moment. Not my words, rather, the words of Sky Sports commentator Ian Crocker. He’s having to scream each syllable down his microphone to the benefit of, not only the television viewers, but himself too. “I think we’ve just seen the goal that’s won the championship, here,” adds the pundit, allowing Crocker to catch his breath. As the goals flew by in Sofia, something happened. A drop, a loss, a departure. Memories wiped blank, evaluations reset and hopes freshly kindled. With Ukraine emerging into view, Bloemfontein faded – unhappy recollections usurped by a new wave of optimism. 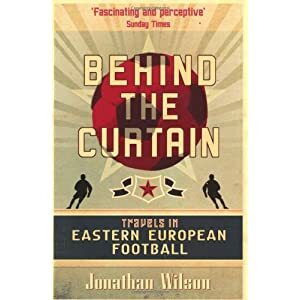 Author of the universally acclaimed Inverting the Pryamid, Jonathan Wilson’s lesser known debut book details the history, culture and idiosyncrasies of thirteen nations’ footballing landscapes.Treks through the forgotten streets of Sarajevo, cups of coffee in Belgrade and late nights in Sofia, at times Wilson’s account of Eastern Europe can take on a sort of action adventure personality. For the writer though, this was part of the appeal. The international break is always a wearing time for fantasy managers. With often five or more starters making long stressful journeys overseas to play in pointless friendlies or, even worse, semi competitive qualifiers, the prospect of an injury crisis mounts without players ever earning fantasy points. However, for close observers these games can act as vital indicators – key factors in transfer decisions and substitutions. Gary Cahill the goalscorer- On the occasion of his first competitive start, Gary Cahill opened the scoring for England with an effort from close range. Interestingly, that goal was actually atypical of Cahill, more often than not his strikes are from long range, that opening day sucker punch against QPR an obvious example. Rooney’s continues to pick up momentum- Wayne Rooney is fast becoming a must have fantasy player. With five goals in three Premier League games, he is the league’s second top goalscorer and is showing no sign of a drop off. Two against Bulgaria merely served to underline his classy displays of late – only a fool would leave him out. Van Persie scores four- It’s difficult to know how much to read into this given that the opponent was San Marino and the final result 11-0. However, Van Persie will nevertheless savor his four goal haul; the striker has struggled for consistency over the league’s opening weeks. With the transfer window concluded, the sense is that Arsenal are ready to move on from August’s horror show, and maybe even start churning out a few wins. Any pick up in form is likely to be a function of Robin Van Persie goals, especially if new signings Benayoun and Arteta bed in well. Park Chu Young scores three- Arsenal fans desperate for encouragement will have been relieved by Young’s performance here. Three goals in what is technically “The World Cup” is not to be scoffed at, even though the opposition was Lebanon. Young represents a fascinating, if perhaps risky, option up front. Part Two coming after the second round of international fixtures. In the mean time, enjoy the rest of our fantasy coverage. Eduardo Alvarez on El Classico and it’s impact on the Spanish National Side. Brilliant article by Andy Brassell about Lisandro Lopez, Argentina’s forgotten striker. James Appel is typically informative in his analysis of Igor Akinfeev’s injury. Jim White talks Peter Crouch and Stoke City. Ashley Young, England and bucking the trend set by under performing wingers. Rory Smith analyzes revolution at Anfield. A brutal summation of the situation at Goodison Park. Kevin McCarra commends England for their away form. Martin Samuel on the importance of today’s England-Bulgaria match.